This entry was posted in Health & safety culture on 2018/06/27 by Susan. 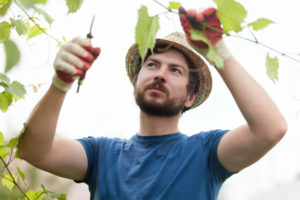 Pruning vines can hurt your wrists, hands, shoulders, and back. To prevent injuries, vineyard workers need to use the right tools, take breaks, and more. The B.C. wine industry contributes $2.8 billion* to the economy each year – and none of it would be possible without the people who work in vineyards. Cheers to all who do this hard work! In the pruning season, these workers spend long hours clipping vines for wines and could surely benefit from the solutions in WorkSafeBC’s Preventing musculoskeletal injuries in vineyard pruning. This information sheet details how “pruning tasks have long been associated with musculoskeletal injuries (MSIs) to the wrists, hands, shoulders, and back.” To find out more about safety for these agricultural workers, I contacted Ryan Duncan, a regional safety consultant with AgSafeBC. Ryan visits vineyards and orchards throughout B.C.’s Interior region. He was in West Kelowna when we talked on the phone. He does education and training for workers on site, many of whom are from Mexico, here on a work visa. Sometimes he brings a Spanish translator. Ryan also works with employers on health and safety programs, general site assessment, planning for training, or help with any other issues or concerns. Ryan says workers often do shifts of six to eight hours during pruning season. And while people are looking at how to avoid wrist injuries, most of the focus tends to be on protecting the back. Obviously that’s important, but so are our wrists and hands.